Companies are failing to adequately explain their purpose to ordinary people, according to business leaders surveyed by City agency StockWell Communications. 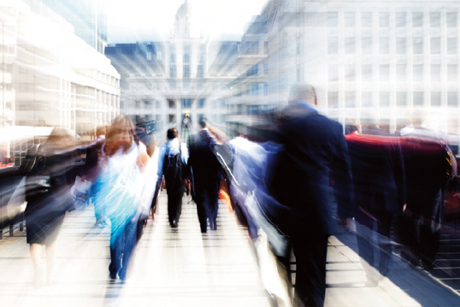 StockWell has today published a reported entitled ‘Poor Company – City and Society’, which examines the relationship between business and society and the related reputational challenges. The agency conducted in-depth interviews with 25 corporate affairs directors and CEOs, drawn from firms including Tesco, Rolls-Royce, BT and BAE Systems. It found the majority of interviewees felt corporates were failing to explain their purpose adequately to the wider public. According to the report, many respondents argued that society provided permission for companies to operate and that understanding the social purpose of the company was integral to this process. However, 60 per cent said that companies as a whole were either poor or very poor at performing this task, while 44 per cent felt they did so well to employees and 36 per cent to shareholders. The financial services sector was well down the list of those companies communicating their purpose effectively, with insurance companies doing poorly and investment banks only just registering on the scale. While a strong financial brand remains at the heart of a successful business, more than half of those interviewed felt a company's society-facing image was now as important as its financial image. There was, however, significant disagreement about the extent to which companies’ shareholders shared this view. The majority felt that overall investors did not really care aside from a few interested parties, which was identified as a potential weak link in their ability to manage reputation. One interviewee called on the investment community to get up to speed with the new business environment. Most respondents felt that the large institutional shareholders and analysts in the UK did not care about a company’s relationship with society and were purely focused on its financial returns. Continental shareholders, it was generally agreed, place far more importance on the social brand of a company. Unsurprisingly, more than 90 per cent of respondents felt that corporate reputation had developed in importance over the past couple of years. 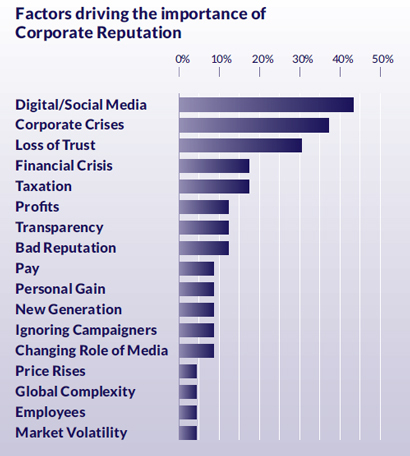 There was more variation in the factors attributed to driving this change, but the biggest driver of change was seen as social media, followed by corporate crises and a general loss of trust in business. Issues such as the financial crisis, excess profit and pay were also referenced widely, but StockWell found that this context did not seem as important, nor as systemic as the loss of trust or the adoption of social media. Many of those questioned also felt that the idea of CSR was old-fashioned and unhelpful in the post-financial crisis world as it pigeonholed responsibility into a department within the company rather than being core to how it operated. Since the financial crisis, it has been clear that relations between companies and society have become more vexed. Unhappiness towards the financial sector has spilled over into more general disaffection towards business, amply demonstrated by the controversy around corporate tax, which continues to reverberate. The world is more transparent, less deferential and digital and social media have provided tools that democratise and amplify these debates. This has produced a challenging and risky reputational climate for companies. It has increased pressure on them to prove to society that they are good corporate citizens, whose activities benefit society generally. More than ever, companies need to show not only that they have strong financial brands (encompassing financial performance and reputation with investors) but also that they have robust society brands (encompassing relations with broader stakeholder groups and focused on the benefits their business delivers to society as well as how they run their business). Bridging this divide is partly about strategy and actions and partly about words and tone of voice. 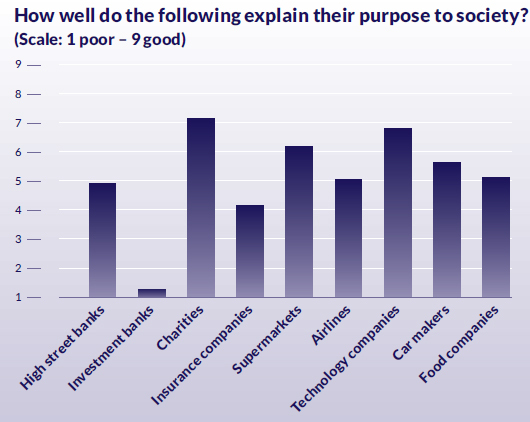 Nearly two-thirds of respondents felt companies were poor at explaining what they did for society. The findings in this report offer significant opportunity for those that understand the value of reputation and the requirement for business to define its place within society.